Investing in Real Estate before a bear market may contradict what you’d categorize as an investment, but we’re here to challenge your ideas about real estate in a falling market. The way you view real estate during a low market may have been shaped by the 2007-2009 recession, but statistics show that its performance during that period was the exception rather than the rule. There have been 20 bear markets since 1952. The Case-Shiller Index shows real estate increases in all 20 of these excluding two: the housing crisis of 2007 and another by which there was a decrease by 0.4%. If we analyze data from the Case-Shiller Index, you can see how 2007-2009 is depicted as the outlier as opposed to the standard. 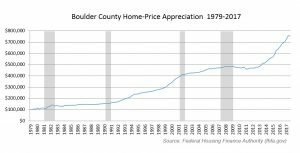 The attached graph represents Boulder County with shaded areas representing recession periods, but most metropolitan areas across the front range experienced similar trends. In addition, long-term treasury bonds outperformed real estate in these 20 falling markets, increasing by 6.2%. That may make you wonder if bonds are a safer bet during a crashing market, but considering today’s low interest rates and the possibility of increased inflation, it’s unlikely that will be the case. Historically, inflation is bad for bonds and good for real estate; yet another reason to invest. We suggest to follow up any information you read online with your own research, but the historical background and the rather circumstantial events that caused the housing market to crash in 2007, real estate is still likely a good investment for the next bear market.